It's been less than two weeks since Hurricane Irma. Hurricane Maria has "rapidly" intensified into a major hurricane and will likely begin pounding populated areas Monday afternoon or evening, the National Hurricane Center warned. Forecasters reported Monday evening that Maria had grown into a Category 5 hurricane moving west-northwest with maximum sustained winds of about 209 km/h. The storm is "extremely dangerous," according to the NHC, and on Monday evening will likely pass near Dominica. 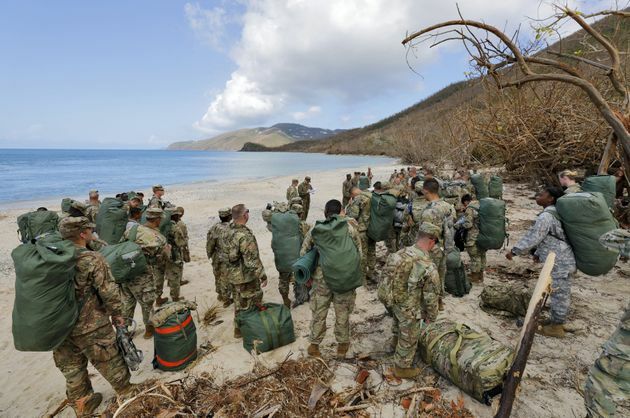 Army soldiers from the 602nd Area Support Medical Company gather on a beach as they await transport on a Navy landing craft while evacuating in advance of Hurricane Maria, in Charlotte Amalie, St. Thomas, U.S. Virgin Islands, Sept.17, 2017. "Additional rapid strengthening is forecast during the next 48 hours, and Maria is expected to be a dangerous major hurricane as it moves through the Leeward Islands and the northeastern Caribbean Sea," the NHC said at 11 a.m. Monday. Maria may begin affecting parts of the Leeward Islands as early as Monday afternoon, and could approach Puerto Rico and the Virgin Islands by Wednesday. As many as 51 cm of rain are possible across the region, and storm surge could reach as high as 2.7 m.
Those islands are still reeling from deaths and damage in the wake of Hurricane Irma. The storm claimed at least three lives in Puerto Rico, at least four in the British Virgin Islands, and at least three in the U.S. Virgin Islands, where electricity may not be restored for months. See the latest NHC advisory for a complete list of hurricane watches and warnings in effect for Maria.